Where my heart is at right now is easing into it all. Autumn is still here (well, today feels like spring, but that’s beside the point). The trees are pretty bare now, though. There hasn’t been snow yet (to be fair, there was none last year at all). But it’s there, just on the horizon (I hope). With red and green and jingling bells and parties and Advent readings and baking. Ah yes, the baking. After poking around the site for Toronto’s Christmas Market last week, I’m in the mood for a little advance baking. Because the market reminds me of images from Rick Steve’s European Christmas on PBS, much of what I’m drawn to right now are treats of the European variety. This means doing a little research into my own European roots, which are largely British and Italian, while my husband’s father hails from Germany. But my husband doesn’t like dried or candied fruits. That shoots down a whole lot of traditional sweets from those areas. And he’s not a fan of spiced cookies. How he’s able to call himself German is beyond me. No stollen, no Lebkuchen, no Nuremberg style gingerbread… *sigh* Don’t even get me started on my beloved fruit cakes and Panettone. Given our son’s peanut allergy, we don’t often have baked goods with nuts in them either. But there is one delight that much of Europe agrees upon. One which my husband loves. Shortbread. 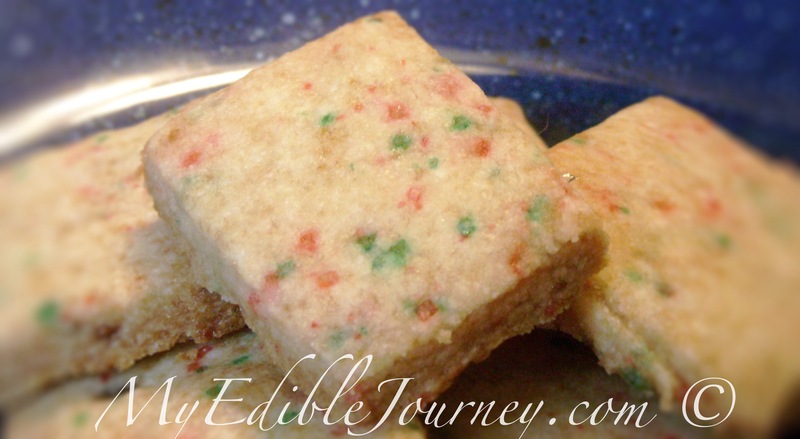 Buttery rich, crumbly, ever so slightly sweet… Shortbread is a wonderful holiday treat. On Pinterest right now there are lots of people repinning these Shortbread Bites. 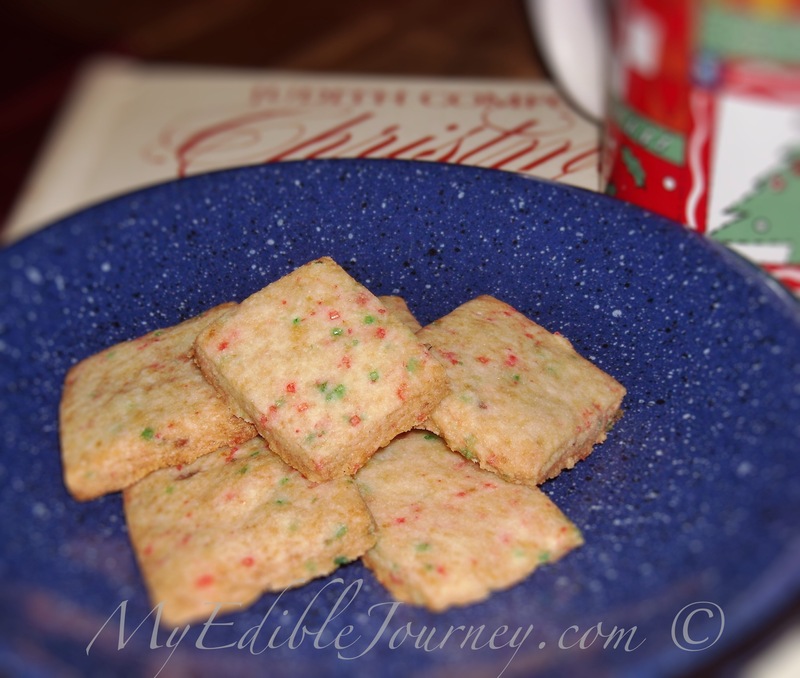 Picture perfect square nuggets of buttery shortbread, dotted with red and green flecks. They’re cute. So I decided to try my hand at them, with a twist (of course). I crushed up a couple of candy canes and mixed them with the red and green sugar crystals for a subtle hint of early Christmas flavour. Sadly, I’ll chalk this up to being a Pinterest fail. The dough was just too crumbly. Even freezing it as per the recipe didn’t help. The few cookies I did get were rather bland, to be honest. Back to the drawing board. Or cookbook, in this case. My favourite Christmas cookbook is called Judith Comfort’s Christmas Cookbook. My middle sister bought it for me over a decade ago, and I’ve pulled it out around this time every year since. One of my favourite recipes is called “My Mother’s Shortbread” which calls for brown sugar and vanilla. It’s more pliable than the Pinterest recipe, and easier to work with. I omitted the vanilla and added a little peppermint extract and a splash of water and tried again. Success (if a little over-brown). In food processor with metal blade, pulse flour and sugar until combined. Add butter, extract and water and pulse until the dough begins to form a ball. Place it into a medium bowl and gently knead in the candy cane bits and sugar. On a parchment lined cookie sheet, pat the dough into a rectangle 1/4″ thick. I pressed my bench scraper against the edges to help square it up. Cut the dough into 1 inch squares. Place squares 1/2 inch apart on a parchment lined cookie sheet. Bake the cookies for 10 to 15 minutes or until lightly browned on the bottom. They will be darker than traditional shortbread because of the brown sugar. Transfer cookies to wire rack to cool. Store cookies in tightly covered container at room temperature up to 1 week, or in the freezer up to 3 months. Yields about 1 dozen cookies. Thanks. They’re different from my husband’s favourites, which are… I don’t know how to describe them. Almost fluffy, I guess. I think his mother makes them with corn starch. These are a bit crisper.